In the past I’ve wrote some blog post promoting documented K2 collation requirement. With release K2 Five this requirement changed and I guess I have to mention it on my blog as essentially it makes my old blog posts about required K2 database collation incorrect. So recently (with release of K2 Five) all K2 documentation was updated and states that our requited collation now is “SQL_Latin1_General_CP1_CI_AS“. Where to find this information? – Case-sensitive databases are NOT supported. What is good about this change is that SQL_Latin1_General_CP1_CI_AS will be default collation if you installing SQL Server on top of Windows Server which has been installed with US location/language settings – so at least some people will meet this requirement by accident. What is bad is that collation requirement was just silently changed in documentation with release of K2 Five without any explanations. According to my current knowledge collation which was mentioned in documentation before was a requirement only for pre-4.6.11 versions of K2. So in case you are doing new installation of K2 4.6.11 or newer make sure that your SQL Server instance provisioned with SQL_Latin1_General_CP1_CI_AS collation. Somewhat mixed blessing is change which was made to K2 Five installer to enforce this collation: what it does at the moment is just enforces this collation on K2 DB level while ignoring SQL Server instance level collation. 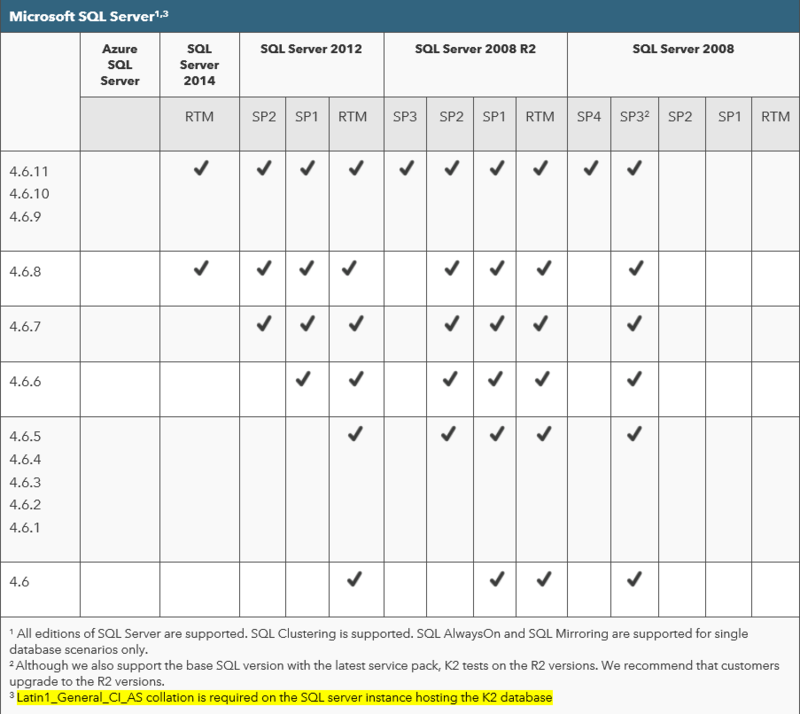 So in case you not provisioned SQL Server instance with the right collation you will get an errors post installation and will be forced to change SQL Server instance level collation to fix this. That’s something that I hope will be corrected in K2 installer in the future so that it warns you about wrong instance level collation issues before you start your installation. This entry was posted in K2, Tech and tagged collation, K2, K2 4.6.11, K2 Five, K2 prerequisites, SQL on November 23, 2017 by Mikhail. This entry was posted in K2, Tech and tagged collation, K2, Prerequisites, requirements on April 25, 2016 by Mikhail. Collation matters. Period. If you not sure just wait till you get an incident or issue which will teach you that it is. Some apps require you to have specific collation for their back end DB. For example for K2 you need to have Latin1_General_CI_AS collation (see my earlier post on that _ ). Nonetheless it can often be the case that your RTFM/Prerequisites_Check moment (I wonder if I can copyright/trademark this term? I heard that Michael Buffer trademarked his “let’s get ready to rumble” phrase _ ) happens after SQL server instance has been already provisioned. For newly created (clean install) K2 database you just need to delete database which was created on instance with wrong collation and allow K2 Setup Manager to create it again after you deal with your instance collation. There is an MSDN article detailing that _ but I will outline the procedure below. 0. In case you have any non system databases attached to this instance take a note of database(s) file location, frequently it is just default SQL instance data folder common to all databases. Save this path or paths to notepad. cd "C:\Program Files\Microsoft SQL Server\110\Setup Bootstrap\SQLServer2012"
cd "C:\Program Files\Microsoft SQL Server\120\Setup Bootstrap\SQLServer2014"
cd "C:\Program Files\Microsoft SQL Server\130\Setup Bootstrap\SQLServer2016"
cd "C:\Program Files\Microsoft SQL Server\140\Setup Bootstrap\SQL2017"
Once this operation completes master, model, msdb, and tempdb system databases are rebuilt (dropped and re-created) with collation you specified in the command. Obviously all your modifications to these databases are lost (if you made any) and essentially it is sort of reinstall/repair type of operation just much quicker and without need to wade through SQL Setup GUI. 3. In case there were non system databases attached to this SQL instance (see step 0) they all are detached now. 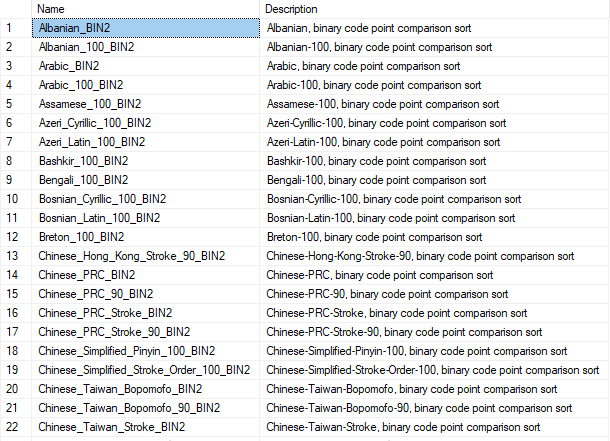 See my other blog post explaining how to attach all the databases from specific folder. This entry was posted in How-to, K2, SQL, Tech and tagged collation, RTFM/Prerequisites_Check moment, SQL on April 14, 2016 by Mikhail. This entry was posted in Tech and tagged collation, SQL on March 19, 2015 by Mikhail.